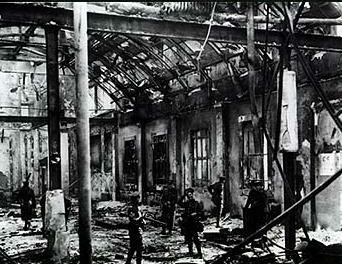 Pictured above: a group of IRB volunteers at left and the state of the General Post Office after the Rising at right. "Among the personalities who directly influenced later events the name of Theobald Wolfe Tone will be found. In turn, the ideas of Wolfe Tone were influenced by the ideas of the French Revolution, and the writings of Tom Paine (The Rights of Man). Paine it was who introduced the political concept of the Independent Republic, with equality of status and opportunity. He died, a prisoner in British hands, in 1798-- the year of the rising which was led by Wolfe Tone. The ideas of Paine and his resolute efforts to put them into effect presaged the democratic movements of the nineteenth century. The nineteenth-century democratic movements in Ireland were based on three motivating forces: 1) Religious and Civil Rights: Movement led by Daniel O'Connell; and which was successful in 1829 when the Catholic Emancipation Act was passed. 2) Land: Agrarian reform, security of tenure, peasant proprietorship, the 'land for the people' are terms and phrases which occur during different phases of land agitation. Apostles for the 'land of the people' idea were James Fintan Lalor (died 1849) and Michael Davitt (influenced by the writings of James Fintan Lalor and John Stuart Mill). The land agitation was successful: Land Acts of great importance which were passed towards the end of the nineteenth and at the beginning of the twentieth centuries gradually abolished landlordism and secured the land to the people. 3) Political Freedom: Important figures in the political struggle are: Robert Emmet (the symbol of youthful idealism), hanged in Thomas Street, Dublin, in 1803; the personalities of the 1843-8 movement: Thomas Davis ('Educate that you may be free'); John Mitchel ('There is no solution save the edge of the sword'); the broad-based democratic movement of Fenianism, 1858-67 (known in Ireland as the Irish Republican Brotherhood, and in America as the Fenian Brotherhood), the leaders of which included James Stephens, John O'Leary, Jeremiah O'Donovan Rossa, Charles Kickham, and, in America, John O'Mahony. A popular movement this, few aristocrats or liberals in it. Militarily it failed, but the organization remained in being on both sides of the Atlantic and transmitted its political message to succeeding generations. . . . The constitutional Home Rule movement led by Charles Stewart Parnell, 1879-90, operated side-by-side with the agrarian movement led by Davitt and Parnell. The Parnell movement owed a great deal of its success to the magnetic personality of the leader. When the split came, in 1890, the movement collapsed. Between 1891 (the year of Parnell's death) and 1905 (the year of the founding of the Sinn Féin movement) the more youthful forces of Irish nationalism took stock. There emerged Douglas Hyde (cultural and intellectual nationalism), Arthur Griffith (economic nationalism, self-reliance, passive resistance), Padraic Pearse, and others; and there commenced the rise of Labour (and urban movement) under the direction of James Connolly and James Larkin; and the reorganization of the I.R.B. with the return to Ireland from America of Thomas J. Clarke (Tom Clarke)" (Rex Taylor, Michael Collins). A date had been set for this rebellion—Easter Monday, April 24, 1916. And what a day it would prove to be, not just for Ireland, but for history itself. The Poblacht na h Eireann, a declaration of independence of sorts, had been signed by a group of amazing men: Thomas Clarke, a member of the IRB and one of the masterminds behind the Rising in his fifties at the time, Séan MacDiarmada, a young man around thirty who helped to organize the IRB, Padraig Pearse, a poet, teacher, and scholar who directed the Gaelic League and made his "debut" as a revolutionary by giving the oration at O'Donovan Rossa's funeral (*please see my footnote on this issue below), James Connolly, a native of Scotland who held Marxist views and served as an official for unions in Belfast and Dublin, Thomas MacDonagh, a talented speaker who frequently lectured at universities, Eamonn Ceannt, an attractive, tenacious, and articulate Irish Volunteer, and, last but not least, Joseph Plunkett, a scholar in his twenties who also worked with the Volunteers. Though the leaders had high hopes, they knew the possibility of military success looked grim. There was no way a group of rag-tag volunteers could beat the British…but perhaps they could deal the Crown a blow in another way. The gang of rebels numbered less than 2,000 but this did not stop the insurrection. At noon, Connolly and Pearse marched to Dublin's General Post Office and this became their headquarters. Eamon DeValera manned Boland's Mill in another part of the city and there were a few other locations under the control of the rebels. Some citizens were taking an interest in all that was happening, but there seemed to be a general feeling of apathy and for some, even a desire to mock the rebellion. The fighting continued for several days, taking an obvious toll on the Volunteers. Collins was serving as an aide-de-camp to Plunkett. Joseph was suffering from tuberculosis and was forced to lean against Collins to stay active. James Connolly had been shot in two places and was placed on a stretcher. Realizing that defeat was imminent, Pearse signed a letter of surrender on April 29, 3:45 PM. Not only was the city in shambles, but, as the rebels left their posts, Irish citizens taunted them. Those with lesser roles in the revolt were shipped off to prison, including Collins who was sent to Frongoch Gaol in Wales. Sixteen of the leaders were executed and almost all of those executions were carried out by firing squad. It was not until after the deaths of the rebels that the opinion of Irish citizens became sympathetic to the pursuit of independence. "The rebels had held out for six days against odds of 20 to 1. During that time, 64 rebels had been killed, while the British army, the Royal Irish Constabulary and the police had lost 134 dead and 381 wounded. Among civilians, at least 220 had been killed and 600 wounded. Dublin was wrecked; in the city centre 179 buildings, occupying 61,000 square yards, had been destroyed. One-third of the city’s population, amounting to 100,000 people, had to be given public relief" (Peter & Fiona Somerset Fry, A History of Ireland). "G.P.O. Headquarters: Supreme Commandant—Padraic Pearse; Commandant General—James Connolly. First Battalion, under the command of Ned Daly: Four Courts, North Brunswick Street, Church Street, North King Street. 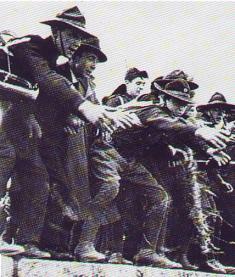 Second Battalion, under the command of Thomas MacDonagh: Jacob’s Biscuit Factory and outposts. Third Battalion, under the command of Eamon de Valera: Boland’s Mills, and outposts from Westland Row Station to Ringsend, and at Mount Street Bridge. Fourth Battalion, under the command of Eamonn Ceannt: South Dublin Union, Marrowbone Lane Distillery, and adjacent posts. Combined Citizen Army and Volunteer force, under the command of Countess Markievicz and Michael Mallin: St. Stephen’s Green and the College of Surgeons" (Rex Taylor, Michael Collins). May 3, 1916: Padraig Pearse, Thomas Clarke, and Thomas MacDonagh. May 4, 1916: Joseph Plunkett, Edward Daly, Michael O’Hanrahan, and William Pearse. May 5, 1916: John McBride. May 8, 1916: Cornelius Colbert, J. J. Heuston, Eamonn Ceannt, and Michael Mallin. May 9, 1916: Thomas Kent. May 12, 1916: James Connolly and Séan MacDiarmada. "Collins showed an uncanny prescience of the power of the cinema in propaganda. At a time when film was still something of a novelty, he had a short clip made in which he and Diarmuid O’Hegarty were shown sitting at a table outside Pearse’s old school and signing bonds purchased by Pearse’s mother, Clarke’s widow and Connolly’s daughter. It was used to good effect in the United States, from where Boland wrote to him: ‘Gee, Boy. You are some movie actor. Nobody could resist buying a Bond and we having such a handsome Minister for Finance.’ In Ireland the IRA over the next year went into cinemas, forced the projectionist at gunpoint to show the clip, and then disappeared before the police and military could arrive. The brief film brought Collins’s name and image before the public as never before. All this was the more remarkable because Collins had taken great pains to prevent the police from having a reliable photograph of him. As late as 1921, during the Treaty negotiations in London, he instinctively moved his head each time a photograph was taken, so that the image was blurred."